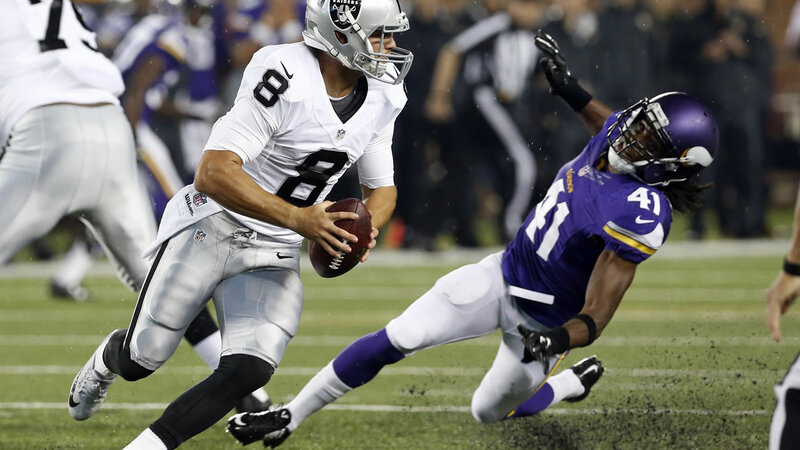 MINNEAPOLIS -- Charles Johnson and Chase Ford each caught touchdown passes in the second quarter for the Minnesota Vikings, who came back from an hour-plus weather delay to defeat the Oakland Raiders 20-12 on Saturday. Teddy Bridgewater finished 10 for 14 for 89 yards, including the crisp 10-yard throw into Johnson's outstretched hands in close coverage to finish the third drive by Minnesota's starters. In three exhibition games, Bridgewater is 22 for 28 for 219 yards and no turnovers. Some of his early passes sailed high, but he settled in and again found a rhythm with short and intermediate routes by his receivers. Derek Carr, the other member of the NFL's 2014 quarterback class who started to hit his stride in his first year on the job, completed half of his eight passes. But he had the throw of the night, a beautiful back-shoulder fade to rookie Amari Cooper for a 40-yard gain.